A special message from Jed Shaffer - WrestleCrap - The Very Worst of Pro Wrestling! Hey, fellow Crappers. No, I’m not pulling a Terry Funk and announcing my … third? … fourth? … return from retirement. I’m here for a different reason. A much more personal reason. If you’re a reader from the pre-Wrestlecrap era, you know that when I retired that time (my first time! ), it was due to the birth of my twin sons, and one of them being born with complications. It was more important at the time to focus on family, so I stepped back. 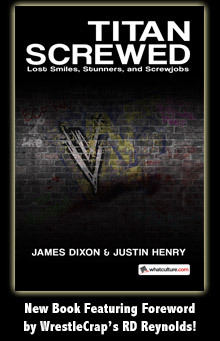 The hiatus lasted for a year or so before I came back with the Survivor Series ’99 storyline here at Wrestlecrap. I was on a mission then, to carry on with what I loved and not be dragged down by what was happening at home. Well, I’m on a mission now, and it’s related to my son. His condition, Goldenhar Syndrome, is one that has no mainstream penetration. If there’s even ONE reader that isn’t already a close friend of mine that’s heard of it, I’ll be shocked. It doesn’t have a charity devoted to it. There’s no colored ribbon to put on the back of your car or wear on your lapel. No celebrity spokespeople fighting for the cause, not even D-listers. No late night, obscure TV channel commercials with a Sarah McLachlan song. It’s believed that as many as 1.3 million children have it, and yet, nobody has heard of it. That may be a fraction of a fraction of a fraction of the world’s population, but these kids don’t deserve to be mysteries. When we say it to someone, we get a head cocked to the side like a confused dog. That’s assuming they ask; sadly, many just stare. I don’t want to change the conversation, because at this point, one doesn’t exist. I want to START the conversation. I’ve signed up with Extra Life, which is a fantastic organization dedicated to raising money for children’s hospitals through the Children’s Miracle Network around the United States. The men and women of Extra Life are all gamers – video games and tabletop – and they raise money by doing live streams of 24-hour gaming marathons. Kind of like a walkathon and people donating for every mile. Only in this case, it’s just a straight donation and one crazy person playing a game. I’m raising money for William Beaumont Children’s Hospital here in Detroit. They’re a wonderful facility that helps countless children and their families, and they deserve the support. On September 1, I’ll be doing a 24-hour live video game stream through Twitch starting around 9am EST to raise money for this fabulous place. But I’m also piggy-backing my personal mission onto it. I want people to know what Goldenhar Syndrome is. I want to end the stares and the faraway pointing. I want to de-mystify. I want to educate. My son and the 1.3 million other Goldenhar kids deserve to have their stories told. And this is where you, the loyal readership of WrestleCrap, come in. I have three links to share with you, and clicking on them is how you can help make this happen. The first link is to the Facebook page I’ve set up in my son’s name. On it, I am posting regularly, explaining my mission. Explaining what Goldenhar Syndrome is and my son’s case. I’ll be posting videos with myself, my wife and my twins, explaining how the condition has affected each of us in their own words. And I’ll show, while he may have born looking different from you and me, my son is no different than anybody else where it counts. I am asking, begging, pleading even, for you to visit it, and to share it with friends and family. Put it front of eyeballs. Get the word out. Help me educate the world. The second link is my Twitch page. This is where you’d watch me do the gaming. I’ll be doing live chat during it (sorry, no video – don’t have a PS4 camera … unless someone wants to send me one they don’t use anymore, haha), so if you’d like to shoot the breeze and watch me attempt something that’s, quite frankly, insane for a chubby 40 year old guy with bad sleeping habits, you’re more than welcome. Especially in the small hours of the morning. I’ll need all the help I can get to stay awake at four in the morning. The last link is the donation page on Extra Life. I’ve set a meager goal of $500. Personally, I’d like to double that, but I thought I’d start small. As of the writing of this, one generous donor dropped a rather astonishing amount all by himself. Now, I’m not setting up some official Kickstarter-style system of incentives; that’s certainly not the goal here. All donations are accepted and appreciated from the bottom of my heart. But if you’re gonna give till it hurts, well, I wouldn’t feel proper without going above and beyond in my appreciation. If all you can do is drop a fiver, well, as Roger Waters says, each small candle lights a corner of the dark. And if you go the extra mile, I love that too … and if you do, drop me a personal line somehow (Twitter at @streetsajed or my email at jed316@msn.com), because I’d like to talk to you. So, please, please, please, PLEASE visit those links. Spread the word. Like the Facebook page and share it so your friends and family can see it. Watch the stream and chat if you have a minute or five. Donate if you can. Beaumont Children’s thanks you. Extra Life thanks you. My family thanks you. And I thank you, for being the most awesome fanbase a guy could ever earn. Your support has been a treasure all these years, and now, I’m asking for a special kind of support. I hope to see a lot of names added to the friends lists in the next three weeks. I believe I will. Because you guys rock. LIVE Money in the Bank Commentary! 11 Responses to "A special message from Jed Shaffer"
Already sharing this via my own Facebook page. Hope this makes a difference. Every share is a pair of eyes that didn’t see it before. 🙂 Many thanks. Good luck Jed, I’ll be rooting for ya! Hey Jed, do you have Grand Theft Auto Online??? Would love to play with you to help, otherwise will spread the word and tune in September 1st! I don’t. Never really been a multiplayer guy, even locally. Probably from being an only child, so I had the Intellivision all to myself. Yes, Intellivision. I’m that old. You said today’s secret word…kids. Always happy to sacrifice a couple cases of beer for kids. Done and Donated!! I hope you destroy your goal!! Many thanks! We’re real close to it the goal already … may have to move the bar up a bit!